The bank recently updated its interest-rate sensitivity analysis. Here's what could help bank stocks more than just about anything else: higher interest rates. With this in mind, JPMorgan Chase (NYSE:JPM) just updated its estimate for how much additional net interest income it will generate if the Federal Reserve continues to raise the federal funds rate, as bankers and analysts expect it to do. On the bank's first-quarter conference call, its chief financial officer, Marianne Lake, said that the nation's largest bank by assets should see its full-year net interest income, the difference between its yield on earning assets and its cost of funds, increase by $4 billion compared to 2016. And that's assuming rates don't rise any further from here. 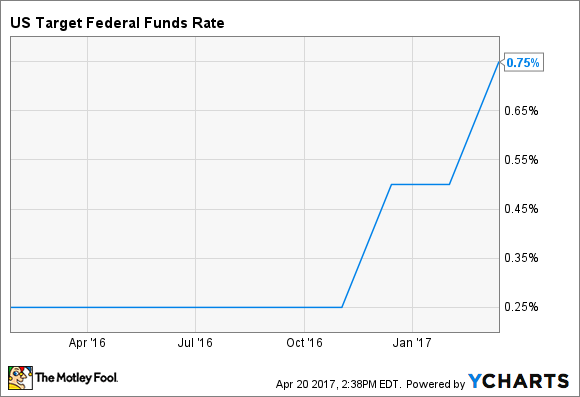 The $4 billion increase is a function of the Fed's decision to raise the fed funds rate in December, and then again four months later in March. All told, it boosted the principal short-term interest rate benchmark in the United States by a combined 50 basis points, or 0.50%. It's important to note that JPMorgan Chase could very well see its net interest income grow even more rapidly this year. That's because the Fed has intimated that it could boost rates two more times in 2017. Its latest dot plot, which happens to be one of the most important charts for bank investors to familiarize themselves with, shows that 14 out of 17 members of the central bank's monetary policy committee expect a total of three rate hikes this year. Once you factor these into the equation, JPMorgan Chase says that its net interest income could climb by $4.5 billion this year, or $500 million more than if rates stay where they are right now. This is yet more good news for shareholders of the New York City-based bank. It bolsters JPMorgan Chase's upbeat first-quarter performance, which reflected a 17% increase in net income. "We are off to a good start for the year with all of our businesses performing well and building on their momentum from last year," said chairman and CEO Jamie Dimon in prepared remarks included in the bank's earnings release. "U.S. consumers and businesses are healthy overall and with pro-growth initiatives and improving collaboration between government and business, the U.S. economy can continue to improve." This doesn't necessarily mean that JPMorgan Chase's stock is a buy right now. It's a very well-run bank, don't get me wrong, but it's my opinion that bank stocks have been trading on an expectations-induced plateau since the presidential election, as the tax cuts and regulatory relief that Trump promised on the campaign trail would spur profitability. If these don't come to fruition, however, then bank stocks will almost certainly retrace some of their post-election gains, which doesn't seem unlikely given the recent struggle to get healthcare legislation through Congress. Thus, I believe that prospective investors in JPMorgan Chase and other bank stocks have more to gain than lose by waiting to see how things play out in Washington over the next few months before buying more shares.